On July 11, two new artworks opened in Times Square, in a major partnership with Times Square Arts. Wake, commissioned by Times Square Arts, is a 24-foot-tall installation that evokes the hull of a shipwreck crossed with the skeletal remains of a marine mammal. The structure is linked with a carved, 21-foot tall animatronic female sculpture, accurately derived from a figurehead of the opera star Jenny Lind, that was once mounted on the 19th Century clipper ship, the USS Nightingale. The physical construction of Wake took place at the University of North Carolina at Asheville’s STEAM Studio, and is a collaboration between the Engineering and Art & Art History, and Drama Departments with assistance from faculty, staff, other students, and community members, all under the direction of Mel Chin Studio. The physical presence of Wake serves as an entry point into Unmoored, an ambitious 21st Century mixed-reality public art project that is a draw for all ages and backgrounds. Unmoored explores a potential future where global warming has gone unchecked – and through mixed reality guests will experience an unprecedented phenomena in the heart of Times Square. Developed in collaboration with Microsoft, Unmoored allows guests to explore this surrealistic spectacle, creating an experience that blends the physical world with the digital world. The Microsoft app can be downloaded via this link. 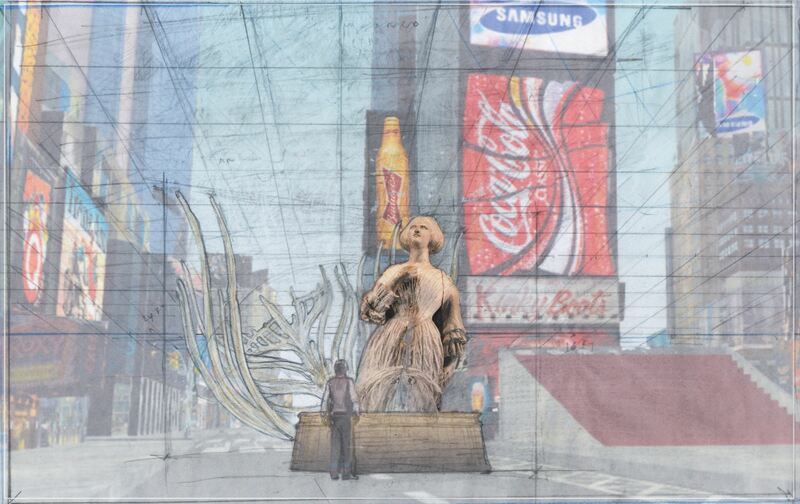 The two public artworks immerse the heart of Times Square in the discussion around climate change. Scenarios on the ground at Broadway Plaza between 46th and 47th Streets, and in the “virtual air” of mixed reality, combine in an ambitious, interactive installation. Co-presented by Times Square Arts, Queens Museum, and No Longer Empty. Image: Mel Chin, Wake Study, 2017. Study by the artist. Courtesy the artist. Times Square Arts’ presentation of Wake and Unmoored is supported in part by public funds from the New York City Department of Cultural Affairs in partnership with the City Council, and by the New York State Council on the Arts with the support of Governor Andrew M. Cuomo and the New York State Legislature. Unmoored has been developed in collaboration with Microsoft. Additional thanks to Unmoored producers Listen for their support.